In the four years since Oracle acquired PeopleSoft, its crystal ball has left prognosticators and customers alike puzzled about the future of its vaunted Fusion suite of applications, despite numerous hints and promises from the company. The promise of Fusion is simple -- to integrate and unify the best features found in Oracle's wide-ranging suites of applications, including applications and features from Oracle's E-Business Suite, PeopleSoft, JD Edwards and Siebel product lines. The problem is the complexity. No one has ever doubted that the Fusion vision didn't represent an astounding amount of work, and while Oracle has been cranking out Fusion-based middleware for years, Fusion Applications have been another story altogether. Wasn't 2008 supposed to be the year Oracle started rolling out Fusion Applications? The answer, it turns out, can be revealed by the surprisingly sparse -- and always vague -- public statements of direction uttered occasionally by Oracle executives to the press and in various conferences. Back in 2005, Phillips did not, however, reveal a timeline. Get caught up on some of Oracle's early applications acquisitions. See more coverage from OpenWorld 2008. Three months later, Oracle said the new Fusion Applications would be service oriented architecture-enabled and let customers integrate with legacy systems and third-party applications. And Phillips cleared up some misconceptions over the presumed cutting and pasting of code from various enterprise resource planning product lines. "We're not merging code. We're going to take what we've learned from all those applications and build another product," he said. Was Oracle half finished with the work? Or halfway done with its timeline? Either way, Oracle said it intended to deliver the first full-fledged Fusion applications in 2008, but again, didn't offer much in terms of detail -- but Phillips also noted that customers wouldn't have to upgrade to Fusion if they didn't want to. 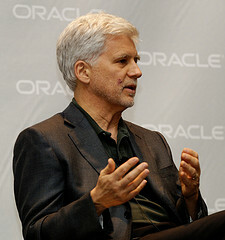 Chuck Rozwat, Oracle's executive vice president of product development, says Oracle has begun to deliver the promised Fusion applications. Oracle did not, however, elaborate on when those Fusion Applications would rise from the primordial ooze and evolve into a shipping product. In 2007, industry concern seemed to point to the notion that Oracle customers wouldn't see a real suite of Fusion applications anytime soon -- and perhaps that Oracle was backing away from its original strategy to focus on delivering only a few Fusion apps. "We've never said that every single feature in every single application would end up in Fusion Applications. We said we'd use InformationWeek. "But Fusion Applications will simply be an additional choice along with all of our other applications. The object model in AIA is the same one that will be used in Fusion Applications, which is a logical design, so it will make coexistence and upgrades easier for those customers that choose to go that route. But many will stay with PeopleSoft, Oracle EBS, Siebel and JD Edwards, and that's fine with us," he added. Then, in October, Oracle shuffled its executives around, resulting in the loss of John Wookey, the company's senior vice president of applications -- and the guy leading the Fusion Applications effort. The circumstances were unclear, which muddied the Fusion Application waters. Did Wookey's exit mean the Fusion Applications were running into problems? Gartner issued a report, "Executive Changes at Oracle Raise Questions Regarding Fusion," that both added a hint of Fusion Application intent and reiterated the fuzziness of Oracle's timelines. "Earlier this year, Oracle communicated to Gartner that version 1 of Fusion Applications, which include financial, human resources, payroll, order management, core supply chain and core CRM functions, will be released in 2008. We don't think there will be a delay in delivery, but Oracle has left enough room in its communications for a change in the breadth and depth of the initial release," Gartner wrote. Gartner's report, it should be noted, seemed to indicate a fairly robust suite of applications that Oracle believed would -- or could -- hit in 2008. The key Fusion Application Rozwat was apparently referring to is part two of our look at Oracle's Fusion Applications project, we get guidance on the future of Oracle applications from analysts, customers and Oracle itself.